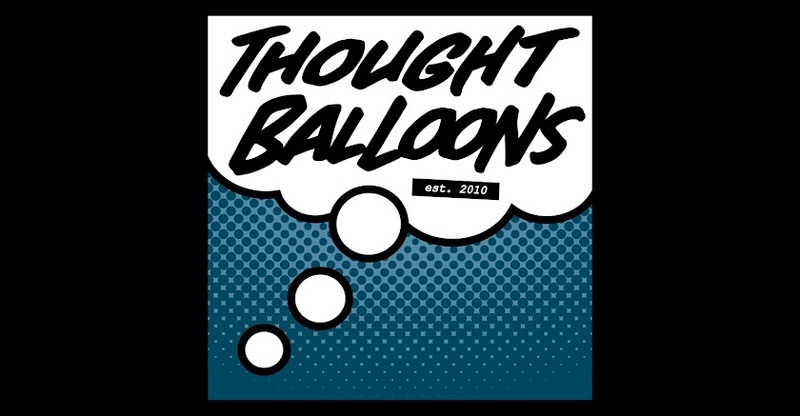 Thought Balloons - Creating Comics One Page At A Time: Why Frog-Man? When it comes to what I think of as some of the best comic book characters, the heroes and villains that I'm routinely most excited about reading, I rarely turn to the best and brightest. No, I am far more drawn to the mediocre and the middling. They aren't the greatest, strongest, smartest, or any of those -est words you'll think of, but they are perhaps some of the most dedicated. Their time will never truly arrive. They'll never make it to the top of the totem pole. They're doomed to spend the rest of their existence playing second fiddle (if they're lucky) to those around them. Some of them know this in the core of their beings. Others have no idea and never will. But in each and every case, they go out there and give it their all anyways. 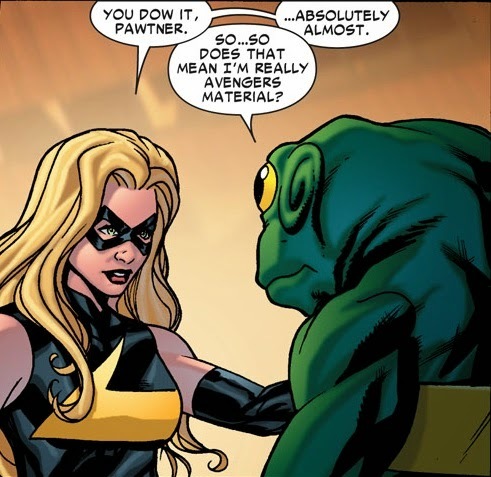 I first came across Eugene Patillo, the Fabulous Frog-Man, in the Spider Island: Avengers one-shot and loved the ridiculous and hilarious portrayal that Christopher Yost gave the character. He was hapless, kind of pathetic, and strangely charming. Despite being a perennial loser, he had an upbeat outlook on life, believing that everything would work itself out in the end. Beyond the great amount of humour associated with him, Frog-Man is a prime example of the phenomenon I describe above. The son of failed, small-time villain Leap-Frog, Eugene decided to "borrow" his father's suit to make up for all the misdeeds of his parent by becoming a superhero. He has one of the most ridiculous names, the gaudiest costumes, and the least respect of any hero you can think of (that is, if anyone bothers thinking about him at all), but none of that matters, because Eugene's going to go out and be the best hero he can be. Day in and day out, he will be there, doing his best. His name isn't going to make the papers. He isn't going to be trending on social media. But that isn't why he does it. He does it because that's who he is. Frog-Man's never gotten a moment in the limelight. To be perfectly honest, he probably never will. All of his stories involve him achieving victory through dumb luck at best or thoroughly embarrassing himself at worst. And yet, he never gives up. He always puts that suit back on. He always goes out to do his part to make the world a better place. It may not be the biggest contribution, but it's his. And no one can ever take that away from him. Frog-Man is a joke to many, but his commitment to his hopes and dreams are laudable as hell. He's never going to give up and never going to say die. If that's not something we should all be trying to live up to, I don't know what is. Plus, there was that one time where he defeated Flag-Smasher by throwing up on him. That was hilarious. This is the week that I ask to join. This week. Frog-Man. Okay, let's do this. Panel 1: A dark warehouse with five thugs surrounding Frog-Man. Sub-Panel 1 One thug being punched with Frog-Man’s right hand. Sub-Panel 2 Left leg kick to a thugs arm knocking away a knife. Sub-Panel 3 Left hand punch square in a thugs chest. Sub-Panel 4 Right leg sweeping the legs out of a thug. Sub-Panel 5 is a stutter panel leading directly into a 6th panel showing Frog-Man’s tongue about an inch away from a thug’s face. Sub-Panel 6 continuation of SP5 with the tongue cracking hard against the thugs face. Panel 2: Bottom right hand showing Frog-Man standing calm surrounded by the five crumpled and bruised thugs. There is a wisp of air flicking out of his mouth. TEXT BOX: A bumbling fool, clearly unable to fend for myself. TEXT BOX: That is my mystery. Welcome aboard, Jason. I really like your idea of Frog-Man building an aura of ineptitude to mask his true skills in superheroing and I dig your ambitious layout in showing that off. The mini-panels do a great job of showing off Frog-Man's true skills and the speed with which he can employ them. That said, I'm a little unclear on the Bruce Lee pose - both in where it would exist on the page and how necessary it is to the overall page. I feel like you do a solid enough job with the rest of it that the badass pose is superfluous to a certain extent, but maybe that's just me. Thank you. I chose the image of a cut Frog-Man ala Bruce Lee to set behind the panels to act as a homage to the one-inch punch; or in this case tongue lashing.